As the main stone approaches 2 carats, the bezel, shank, and prongs have more effect on the elegance of the final product. This elegant and impressive ring is set with a beautifully brilliant, two-carat-sized round brilliant cut diamond in the center with half-moon diamonds on either side. From certain angles, the combined diamonds look like an oval shape of over five carats, set sideways. The conception is one that concentrates on bringing out the diamonds, using as little metal as possible while maintaining durability. The bezel is narrowed in a make that allows this ring to be worn stacked with a band-type ring. The ring to the next page is made with the director clearly explaining the conception to the artisan, who then uses his skills to execute it as best as he can. As the main gemstone in a ring approaches two carats in size, the bezel, shank, and prongs will have an increased effect on the elegance of the finished product. The angle, height, and shape of the bezel take on greater significance, as do the shank’s thickness and shape, and the way the shank and bezel are connected. The shape of the prongs and the way their heads are rounded also become more important. Because of this style’s simplicity, the artisan’s skill and attention to detail influence the quality of its make and whether or not it is an attractive, well-balanced, and comfortable ring. Note the elegant appearance of the bezel, shank, and prongs. The ring below was created with regard for the beautiful continuity of the three round brilliant diamonds. Compared to a 0.3-to 0.4-carat-size diamond solitaire ring, this diamond three-stone ring has stronger brilliance because of the surpassing beauty of the arrangement of the three similarly sized round brilliant-cut diamonds. Many jewelry stores in the West emphasize the three-stone ring, including those set with colored stones, as a jewelry category of its own. 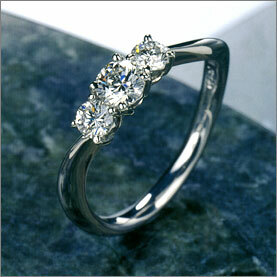 Three-stone rings are attractive and traditional, and they are cost-effective. Since they are also easily stackable with other rings, three-stone rings can be enjoyed on a daily basis.